Last one to the finish is a sushi-roll! Horses and greyhounds are boringl. Crustaceans, meanwhile, are awesome. Therefore, crab racing > horse and greyhound racing. Okay, well it doesn’t quite hit that same crescendo of excitement as when a thundering pack of thoroughbreds stampede past you towards the finish line, nor do crabs have the same uncanny agility and speed as the wiry greyhound; but they do have claws and are amusing to watch – so advantage: crab. 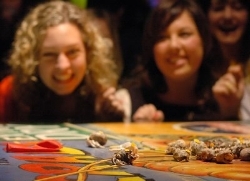 Anyway, crab racing is a popular pub sport, where a group of crabs are let loose within a large marked circle, and the first one to scuttle its way outside the circle, wins. Bet on your favourite crab, win some beer tickets and you’ve got yourself a pretty amazing sport. As long as the crabs are returned safely into the estuaries post-race. Animal cruelty is wrong. Multi-discipline sports unfortunately don’t carry much prestige at international level – odd considering the Olympic decathlon demands competitors to rise above the rest over 10 gruelling events. In fact, since 1912, the victor of the Olympic decathlon has been traditionally declared the ‘World’s Greatest Athlete’. Currently that ridiculously boastful title belongs to American Brian Clay, though you wouldn’t know that over the vainglorious antics of Usain Bolt. Put a discus in Bolt’s hand after a 100m sprint and you’re likely to see him improvise a dance – give it to a decathelete, and he’ll fling it 60-odd metres before running off to pole vault over a five metre bar. So, respect for multi-discipline sports I have… except for those gun-toting Scandinavians on skis who turn up for the Winter Biathlon. Ski cross-country for a while, shoot some targets, ski a little more, shoot some more targets… and so on until 20km and 20 dead targets later, a winner is declared. That’s it really. It originates from Norwegian military exercises – but that doesn’t afford it legitimacy as a sport. If that’s the case, why don’t we see athletes running through tyres and commando-crawling through mud and barbed wire for Olympic gold? 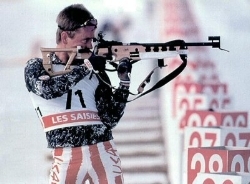 Skiing and shooting is just too odd a combination to take seriously. Plus there’s the genuine risk that a closely contested run to the finish could lead to a homicide shooting. Swap the shooting for a couple of those massive ski-jumps and then we’re talking. I should just leave it at the name. After ensuring my Google filter was on ‘strict’ while researching, I discovered that fistball is actually pretty awesome. First of all, it dates back to Roman times, awesome. Second, it’s incredibly easy to play, awesome. Fistball is a hybrid of volleyball and tennis, where two teams try to punch a ball over the net into their opponent’s side of the court. The ball can bounce after each contact and players can roam their side of the court freely. Simple. Although it seems like your typical game played at lunchtime by schoolchildren, fistball is an international sport. Why’s that awesome? Since it’s pretty much only Germany, Brazil and Austria who turn up to the Fistball World Championships every four years, there’s opportunity to gather up some buddies and become a bonafide international fistballer. That’ll get the ladies swooning. Unless your name is Quentin Tarantino (yes, your films are sublime but I’m onto you, you cinephilic foot-fetishist), most people find feet and toes a bit weird and icky. So, the sight of two strangers’ toes locked in a writhing, twitching struggle is enough to tickle the gag reflex. But the fine folks of Derbyshire, England see nothing wrong with settling a difference with a good ol’ toe wrestle. After each competitor undresses the other’s foot ( :| ), players pit bare foot on bare foot and must pin their opponent’s little-piggies for three seconds to win. Intriguing nicknames seem to be an important part of this sport too, judging by some of the decorated legends of toe-wrestling. Historic titans of the toe include Tom ‘100m’ Martin, Alan ‘Feisty’ Nash and Paul ‘Tomatominator’ Beech. Oh, and obvious ‘athlete’s foot’ joke goes here. The peculiar, but astonishingly skilful discipline of Flatland BMX is described by some as ‘artistic cycling with a blend of breakdancing, Zen meditation and martial arts’. That, or it’s a case of someone who is really, really confused about the correct way to ride a bicycle and is having a difficult time trying to dismount. On purpose or not, it’s an amazing feat of balance and grace, and indeed the most balletic you can get riding the mode of transport favoured by beanie-wearing convenience store thieves. 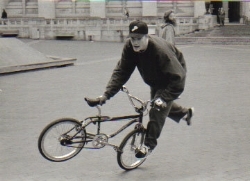 Sadly the concept of dancing on your bike wasn’t extreme enough for the organisers of the X-Games, who dropped Flatland from its roster (extreeeeeme roster, that is) in the early 2000s. Flatland still finds a competitive home on occasion thanks to independent events such as Red Bull Circle of Balance, but the Billy Elliots of the extreme BMX world continue to keep their handlebar gyrations mostly underground. 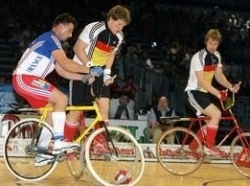 Combining cycling and indoor football (or futsal), this most-excellent sport is also called ‘radball’ by the Germans. If anyone invited me to join in a game of ‘radball’, it’d be a yes, yes and oh-please-god-I-want-to-be-involved yes. Radball is a two-on-two encounter, where players mounted on hilariously un-sporty fixie bikes use their wheels or heads to move the ball around and try and score a goal. At no point can a player’s feet touch the playing surface, adding a new dimension to the madness as teams sometimes try to ram their opponents off their bikes. There is impressive skill needed to be a successful radballer; you need supreme balance and dexterity to manoeuvre about, twisting your handlebars to smack a ball with power and accuracy. The sport has been around, amazingly, since 1893, where the players presumably had huge moustaches and rode on penny-farthings. If only Youtube was around then. The crowd were hesitant to clap lest it be just another lost turtle and not a competitor. Like fistball, I was dubious of the internet’s infamous knack for taking everything you know and love and making it revolting, so Google was once again on strict to investigate bog snorkelling. Like the worst snorkelling excursion ever, competitors don flippers and snorkels dive into a 60-yard long trench of dense, smelly peat bog and try to race to the end in the shortest time possible. Snorkelers cannot use any conventional swimming strokes; they must instead rely only on the power from their flippers to propel them through the thickshake of mud, muck and decaying plantlife. 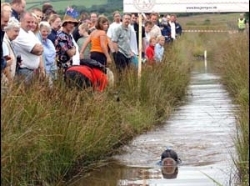 Originating in 1976, when a couple of Welshmen concocted the idea (after what must surely have been at least six pints) at the Nueadd Arms, bog snorkelling now has a World Championship that has run annually since 1985 (except in 2001 when it was cancelled due to foot and mouth disease – indeed). The current world record stands at 1m 24s, set this year by Andrew Holmes. Well bogged sir, well bogged.